DECEMBER in my Modest Epiphanies 2019 Calendar (now sold out). This is a nice balance between ambient twilight and flash, which shows as only a hint on the flax. Most magazine photos with close-up subjects (especially people) are illuminated in the same way, but often with the subject massively highlighted. The Sugar Loaves – so named by Captain James Cook – are volcanic remnants about 1.75 million years old, adjacent to (and partly sheltering) Port Taranaki. This view is from the base of the most conspicuous remnant, land-based Paritutu Rock, looking out on to Motumahanga (Saddleback), the most outlying of the islands. Not every image in my Modest Epiphanies 2019 Calendar was actually taken in the month it displays, but this autumnal scene was a good fit for MAY, although the only hint of autumn being in the misty background. New Zealand’s native vegetation is almost entirely evergreen, but summer shows with flower stalks on the flax and crimson flowers on the pohutukawa branches. This scene is Kiwi As, and most New Zealanders would correctly place it north of the Waikato River. 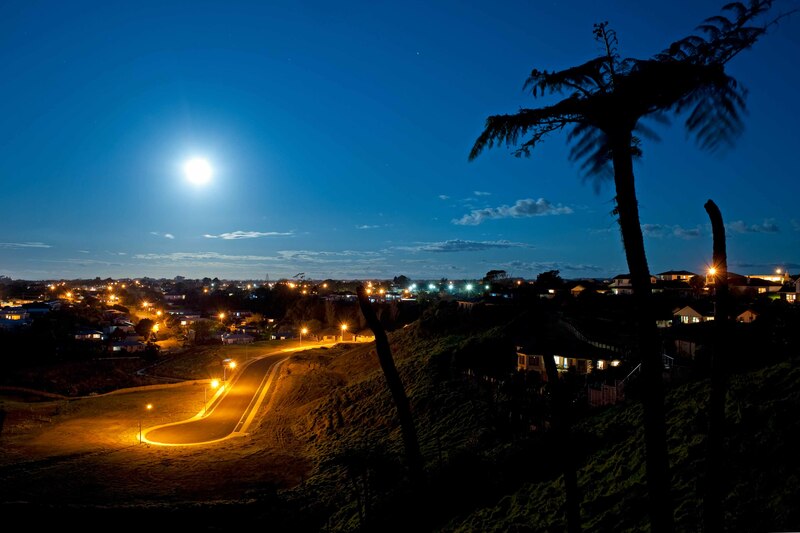 The Awhitu peninsula has a remote feel, despite the proximity of Auckland’s bright lights across the Manukau Harbour on any evening. The topography is surprisingly rugged, owing to the area being largely old dunes of great size and steepness. Lagoons abound and with flat, defendable heights nearby the district supported many small Maori settlements in the early days. The appeal here rests on the extra texture of the raindrops on the leaves, enhanced also by the muted framing and background. The Lumix is a sturdy, versatile camera, and amazingly light in the hand (and on the hip) after any time spent lugging around the Nikon D700 and a heavy 85mm telephoto. 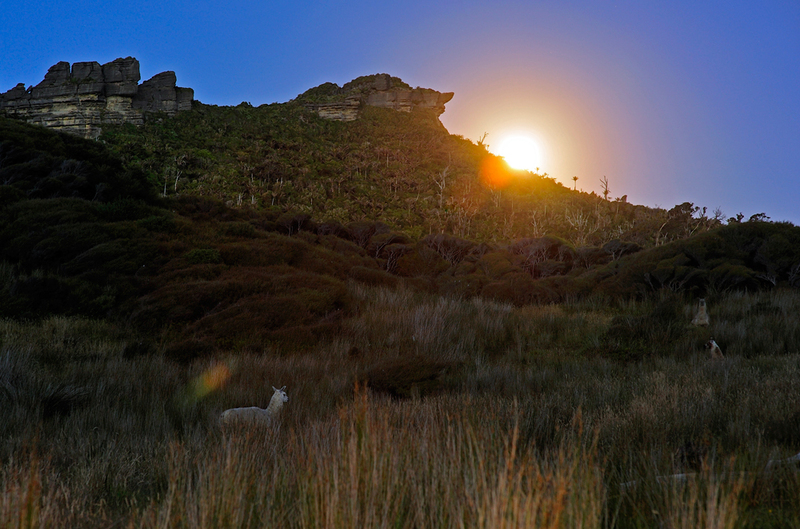 New Zealand’s varied landscapes must be world-famous because now they are talked of by the mainland Chinese, not just wealthy HKers or Singaporeans. A busload of Chinese tourists joined the 40 cars already parked at the Kaikoura road-end, out on the peninsula. The changes to be seen here surprised me, and I am not referring to the recent earthquake uplift, impressive though that is. No, to me it seemed no time at all since this road-end was a broad, featureless gravelled cul de sac; today it is a well developed tourist amenity. The bus tourists fanned out across the wide shelf of the reef, while others were intrigued by the nearby seals. Not far back along the road another 30 cars were parked by an outdoor cafe, the first I recall seeing by a New Zealand roadside. How we will cope with our rapidly increasing tourism remains to be seen, but the obvious problem is the same one worldwide – overcrowded hot-spots, with amenity development lagging behind. 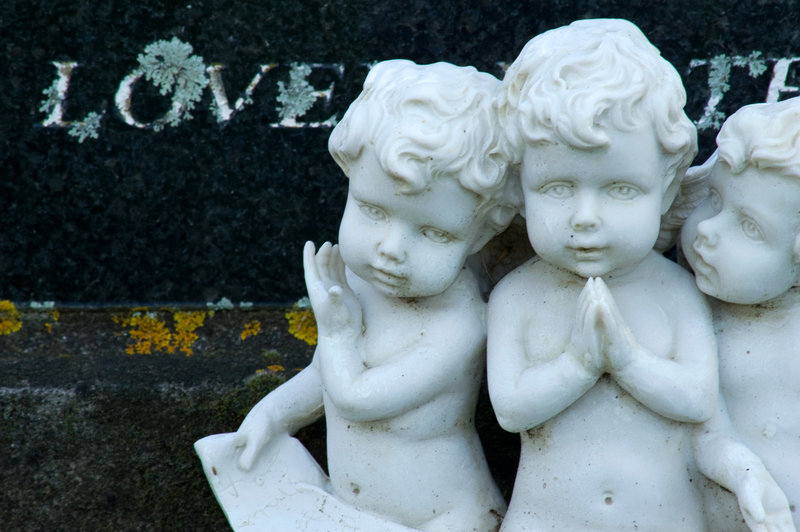 These cherubim fronting for love caught my eye in a cemetery-with-views on a Mokau hilltop. Having recently purchased a Nikon zoom lens (70-300mm) I was putting it through the paces, late one winter’s afternoon at this small community on the west coast of the North Island. Using the tripod to allow slow shutter speeds, I was interested to see what the zoom did at the longest extension, especially at closest focus, and when well stopped down. While I was impressed that the lens went to f45 – a ratio usually seen only on large format lenses – only later did I learn about the diffusion effect at such tiny apertures, with DSLR cameras. An odd occlusion occurs – a bottle glass effect might be the easiest way to describe it. Fortunately none is seen here. I like the juxtaposition in this image, and little group is an uncommon sight too. Exposing for marble sculpture can be tricky, and typically they are overexposed “in scene”, but at close range getting a good range of tones from marble is less challenging. These boys being at ground level were at least clean of the usual overgrowth, a definite problem on taller monumental figures, where beyond easy cleaning reach unsightly lichen and moss can become well established. Memento mori: In turn we all take our leave. But love lives on, at least. 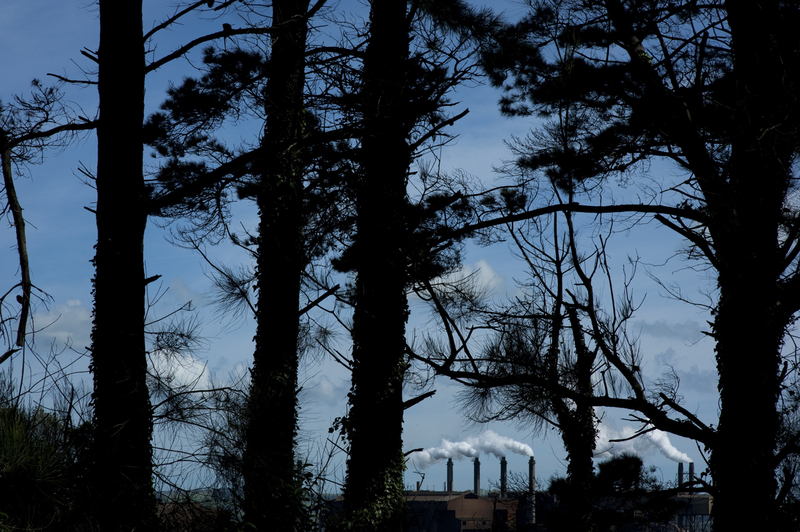 As a magnificent blot on the landscape the steel mill at Waiuku, south of Auckland, is very impressive. In this shot its dreariness is stylised by layering, using the line of pines it is seen through. Another example of a “look-through” composition, this is one I was definitely searching for. Here the main feature seems almost an afterthought, but one nicely offsetting the dark verticals. The scene is also an example of limited palette (colour range), being close to monochromatic. However I saw during set-up the small smudge of green plant life at bottom centre, and the brown building below the belching chimneys. I took a second shot with the mill in a more central position, yet this was less interesting. The scene above is underexposed of course, to saturate the highlights, and a smaller aperture can be another gain in doing this – and increased depth of field, no small matter with a telephoto lens such as the 85mm. Using f16 has insured sharpness throughout, with the luxury of a low ISO and a hand-held capture, to boot. The phrase “Dark satanic mill” comes from an eschatological poem by William Blake, whose text also forms the lyrics to the well known hymn Jerusalem. This contrasts the forthcoming heaven-on-earth of the title with the hellish blight of many hundreds of mills, which scarred the country as it became the first to industrialise. 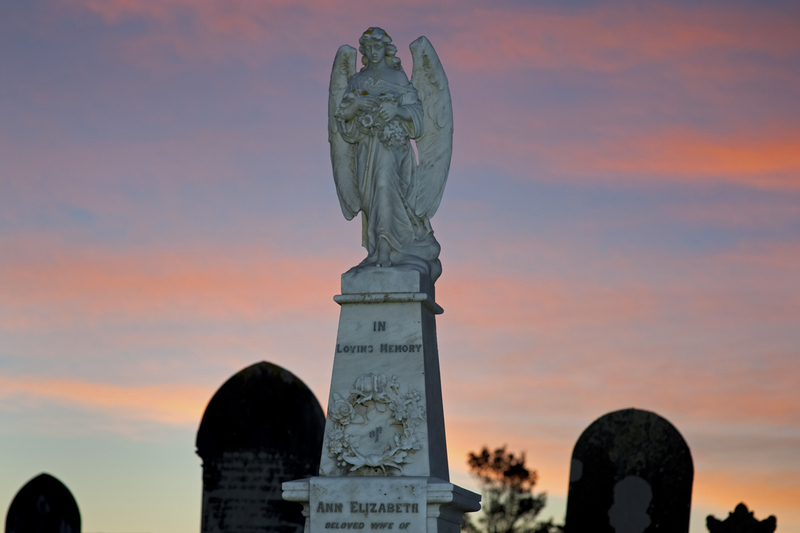 I have begun a new project: a series of cameos from New Zealand cemeteries, taken by day and night, styled under the Latin term above. No longer a common phrase, memento mori translates to “Remember that you have to die”, meant as a reflection on our inevitable mortality. Cemeteries, and particularly older ones, are sanitised theme parks testifying to this hugely inconvenient fact. They are also places where one can nod to one’s ancestors and their collaterals, witness innumerable past lives (some long; many short) and war casualties, and see unusual sculptural forms. It is generally the only place where Westerners can encounter angels, which are very distinctive forms and ones I rather like. There are two main challenges here, the main one being to balance the flash with the steadily fading daylight – this requires an effort with aperture selection and distance, owing to flash fall-off. For example I would’ve preferred f8 or f11 (rather than f5.6) for better depth of focus, but these weren’t practicable because the flash was not so strong at that distance. The second consideration is to crop surnames from headstones wherever possible, although occasionally a single distinctive name adds to the effect, as we shall see in due course. Karoro Cemetery is on Greymouth’s outskirts; it is a large and open setting, on a long, flattish terrace; we walked there in a roundabout way from the holiday park below. My Thai companions walked through the place reluctantly, from cultural apprehensions, and did not linger. However I found plenty of interest, as night gradually fell. Two problems in volcano camerawork are vacant skies and the huge gap in exposure values between the snowy elevations and the green landscape below. Here with patchy cloud and silhouettes is an answer to this creative challenge. Lacking as it does spring lambs (and mint) this image does not quite reach the bar, yet I find its ellipsis strangely appealing… On the approach, in a clear sign of ascending middle age, I was more concerned with the wear of the gravel road on my tyres than with how the icy edifice might loom in my viewfinder. 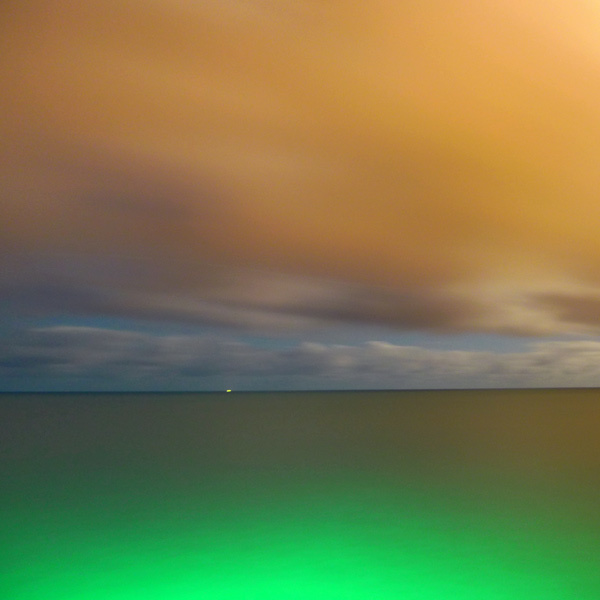 The cold sou-wester also dampened my interest, but what I like in this half-submerged image is a mistake in my colour temperature setting (Sodium vapour lamps), which still leaves its mark. It’s all a happy accident, in other words. 85mm; ISO 250. f11 at 1000th sec. My interest in these stripes was partly spurred by my SO’s work in creative fibre, designing woven creations with striking bands of colour. The strong reflections here are in the surface topography. This is very close-up by telephoto standards and the wide f-stop only just copes; a better depth of field would be achieved with a faster ISO and slower shutter speed. However I had set out without tripod – as I often do when my photography is secondary to a social outing. Even for an exposure of 1/500th I used the self-timer at 2 seconds to delay exposure slightly, reducing the risk of camera shake, something that is magnified with telephotos. I have photographed these cliffs before but only occasionally, as they are an hour north of New Plymouth on a side road, and access is strictly tidal. The beach changes from sand to rocks with the seasons, while recent rain makes a difference to the rockface patterns observed. Here we’re looking at a well-watered part of the cliff at about eye-level, with much reflected early afternoon sunlight. I selected a low ISO for maximum effect but also a high shutter speed, to avoid any risk of camera shake with a heavy telephoto. 85mm; ISO 250. 1/640th @ f11. 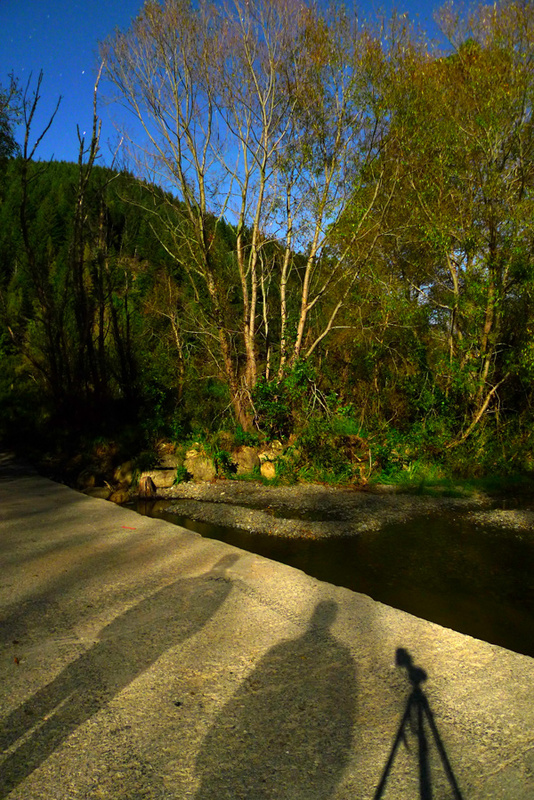 In late April a quick trip to the Maitai Valley, on the edge of the city, is much easier than the long road to central Otago (where great swathes of lovely poplars and cotoneasters are now gone from our favourite walk at Arrowtown). Although the light balance between flash and background above suggests twilight, this cameo was actually taken half an hour before sundown, in the pre-drizzle gloom of a heavy overcast. Flash is a crude instrument but then so is a hammer – and after a few attempts I felt I had it nailed. Clouds strike some marvellous poses, but as they will not hold them the trick is to be ready and waiting. Even better if they are only a side-show to the main act – an anticipated moonrise, for example. A big Nikon zoom lens needs a tripod for best results, especially with a polarising filter. A tripod does restrict you but it allows a much smaller aperture, which helps with overall sharpness after the filter and softness of a zoom lens are taken into account. Using a tripod also ensures a more considered approach, and more level horizons. The polariser, meanwhile, only works from a certain viewpoint, that is, one at roughly 90 deg to the sun. So you might as well stay in the right spot with your tripod. Zoom lenses are very engaging, but the price of their versatility is their typically lacklustre definition, and the extra care required in their use – especially with focus and depth of field. I have found with the Nikon 70-300mm that no really serious work can be undertaken without a tripod, and a self-timer release of 2 to 5 seconds, depending on the focal length and wind strength. Here a slow shutter speed resulted not only from the polariser (effectively 2-stops) and the low ISO but also the need for a small aperture for depth of field. The polariser works wonders on cloud forms at right angles to the sun, which was low to the left. 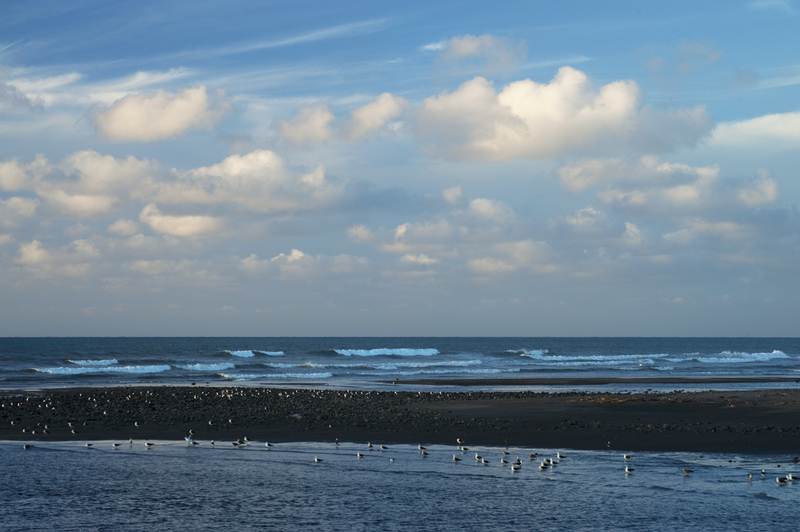 The gulls are enjoying the dog-free side of the river; their beach was soon covered by the incoming tide. 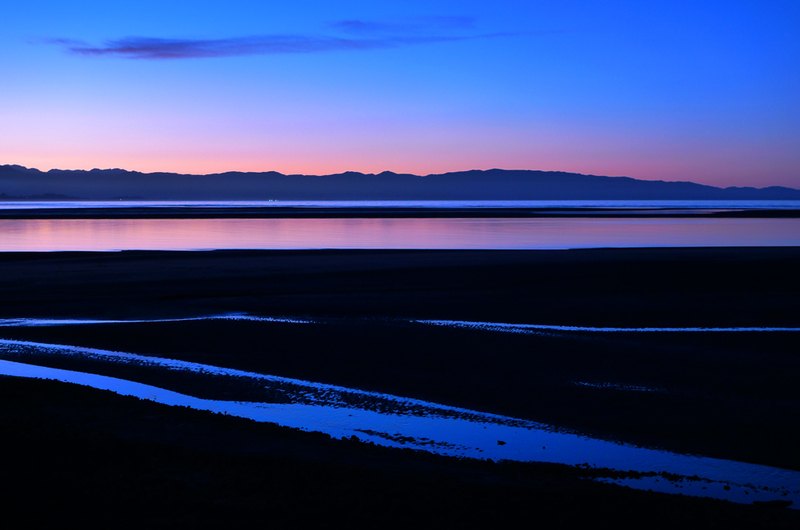 Whatipu is a vast expanse of beach and wetland on Auckland’s west coast. It’s a wild place and amazingly changed since my first visit over 40 years ago – wider and wetter, it is now also far more vegetated. On a winter’s afternoon we barely sampled the place – there’s hours of it. After only a short interlude of sporadic sunshine, threatening cloud suggested a retreat to the car. 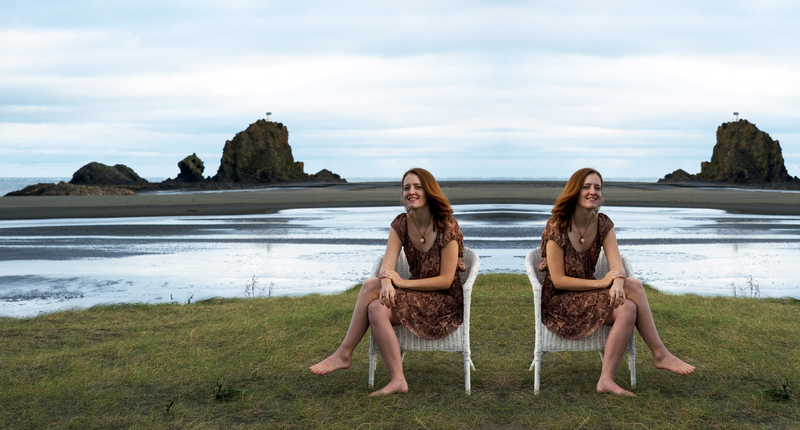 Here Claire and her faithful doppelganger appear to enjoy some brief relaxation, in between rays. With thanks to Lucy for the chairs and Yana for other assistance. The old water reservoir at Nelson is a peaceful place for pic-spotting by the moonlight photographer, in part because access to it is through a motor camp. It may be needless to say, but when you’re out at night it’s important to feel safe so you can focus on creative work without any unpleasant surprises. This location is just a few hundred metres from where I parked on the other side of the vehicle gate; distant sodium lights which overlooked my car have flickered through the foliage to show several minor bands of orange here. 28mm, ISO 100. 5 seconds at f22. Incandescent light balance. Ratapiko is a small hydro lake near the edge of the Taranaki ring plain, about 40 minutes northeast of New Plymouth, in a quiet country district. Quiet on a winter’s evening at least, as in season Ratapiko is popular for boating and water skiing, but this night our main concern was low cloud and whether the mountain was even in the frame. The peak could not be discerned through the long Takumar telephoto on the Pentax Spotmatic F, as its maximum aperture is f4. Actually the mountain was hardly visible by eye, and this composition could only be made by referring to a 60-second trial shot on the Lumix LX3 – which does not have a telephoto capability. I then extrapolated a longer exposure (unrecorded) for better star trails and a smaller aperture, to get the best focal depth from the lakeside trees to the mountain. 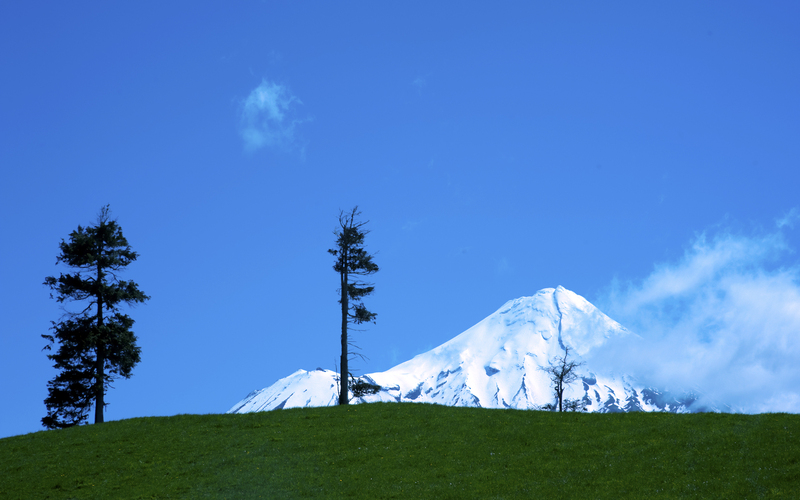 As often, Mt Taranaki looms above low cloud at 2518 m (8260 ft), in a common composition of vertical and horizontal thirds. The striking red shift is mostly reciprocity failure from such a long exposure on colour negative film (used here in desperation), but looking again at my digital trial shot suggests there is also some light scatter from the nearest towns, Stratford and Inglewood. The early evening was really dark as the waning moon only rose at bedtime – a good opportunity for star trails, although I expected to see more. Next time I will use a shorter lens, frame this as a vertical and have the trails reflected on the lake, even at some sacrifice of the peak’s prominence in the frame. Speaking of reflection, the quote from the American philospher is apt for the pause that l-o-n-g exposures enable. Working with two cameras, however, generally means less reflection and instead for me the satisfaction of more activity. Night-blue signals tungsten film! It was not something I usually shot with, but in my younger days I used whatever film was affordable. To get balanced colour in daylight you had to apply corrective filters, but none were used here, so the blues are intensified. Pre-digital, this was a common trick with advertising photographers shooting wintry subjects, moody nudes or studio noir. As I’ve said before, moonlight is actually like a warmer daylight when exposed for that effect. Here on a crisp autumn night we are looking east across a wilderness of tussock, from the roadside bounding Tongariro National Park in the central North Island. 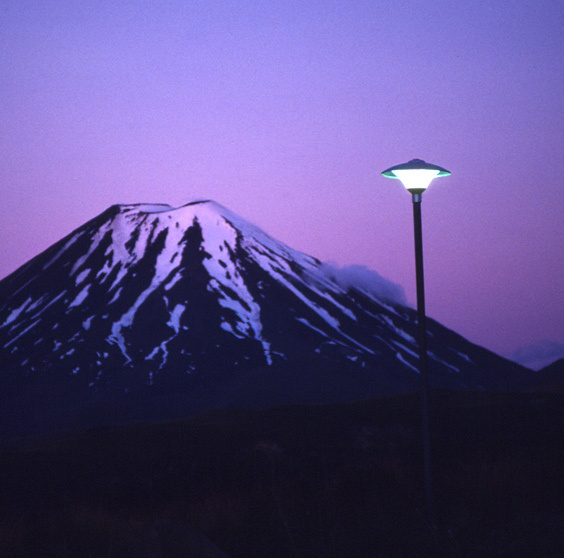 Ngauruhoe is a young 2291 m (7516 ft) stratovolcano, steeper than it looks here and snow-free for much of the year. It last erupted in the mid 1970s. 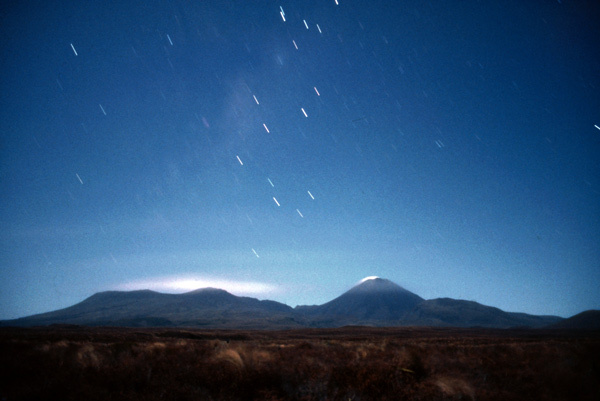 The massif of Tongariro (1978 m; 6,490 ft) is an older, more complex structure, while the even larger bulk of Ruapehu is out of sight to the right. The contours on the peaks are visible; I like this especially for the cloud wisps and the star-strokes. The hint of cloud in the middle puzzles me but the fainter stars show the effect of a blue sky better than can the rare sight of Venus in the late afternoon. Only the brightest of stars can compete with a moonlit sky. Conversely, on a moonless night far from urban light sources, a myriad of stars are visible. Exposure was unrecorded; all film exposures for moonlight are educated guesses beforehand, as the variables are considerable. I generally double the time indicated by a digital trial, to make up for film sensitivity decreasing over long exposures (known as reciprocity failure). The odd thing is that in doing this it takes the same camera-time as a digital shot, which in applying a dark-frame immediately after each long exposure (for noise control) also doubles camera-time. There’s no better time for moonlight photography than when you are on holiday with a large territory you are free to wander over. Here’s a memorable evening at summer’s end with a cool southwester still about, as indicated in this well-clad group study. 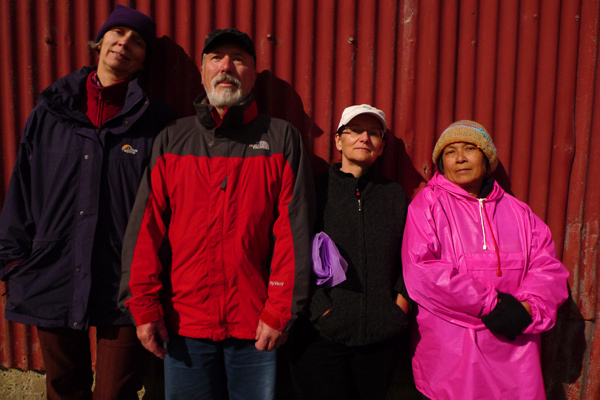 Remarkable about this line-up at Kaihoka, Golden Bay is my lack of better stage direction and that these obliging folk have all held still for half a minute. At least I have separated the two coloured jackets and arranged people by height, while the long shutter is a necessity with the Lumix LX3 as anything over ISO 200 results in excessive noise. The skin tones are great and there’s a pleasant warmth overall. If this was a daylight photo only its slight underexposure might warrant comment, but this is no-street-light-for-miles, 100% full spectrum moonlight… the kind I really like. My nameless victims are resting their heads against the corrugated iron to help hold their poses, a technique evocative of old-time daylight photography. In the 1840 – 1890 era slow emulsions required similarly long exposures, and the same sort of accommodating poses. When you attempt this sort of line-up yourself, try one with the last person on the right moving about in a blur. As we typically scan images left to right, this should create a startling effect. So why didn’t I think of that at the time? Despite the possibly unsavoury context for the quote, I use it as an unsubtle prompt for two of the people shown and as a reminder to myself as well, to “Get going!” As a fatuous generalisation there are two types of people: those who have trouble finishing anything, and those in the opposite camp, who have ignition issues. Active self-starting bodies are in the first division; passive vessels with hard-to-find crank handles are in the second. “Some highway” means that I do not know exactly where this was taken. 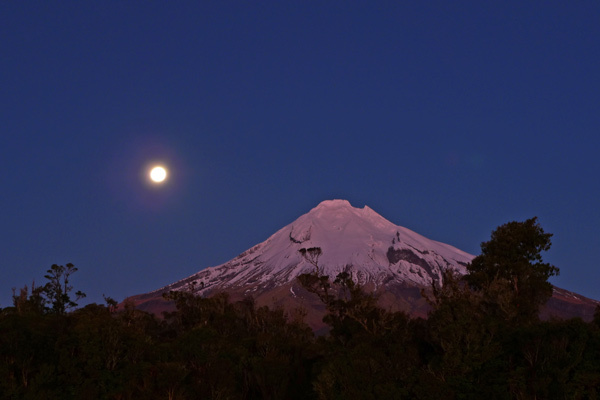 On Easter holiday near Tongariro National Park (central North Island), we were off for a drive-about, on the night before full moon. Here we might be on the Turangi road or, less likely, the main highway south, but traffic is light and I’m glad the headlights aren’t coming towards us because they would flare the lens. So I’m in the passenger seat of John’s Triumph 2000 with the tripod over my lap and I’ve asked him nicely not to move at all for a spell, while the film works its magic. Fortunately he’s a patient fellow and ever ready to indulge the creation of Art. Both depth and movement enhance this simple composition but another 30 seconds would have improved the exposure. Thanks anyway, John. 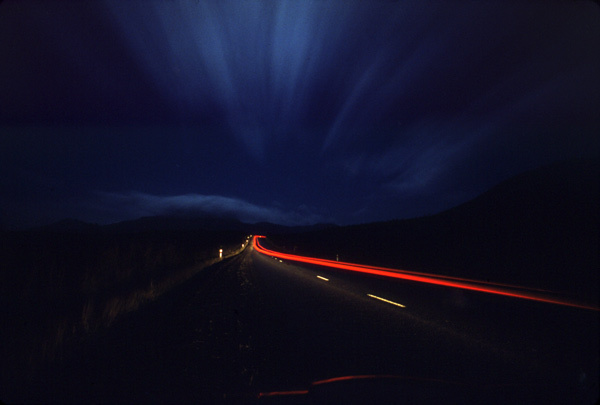 The car bonnet is visible in this wide angle view; the streak of the passing car would be more orange but for my using tungsten film. Tungsten is the old equivalent to digital’s Incandescent light balance setting – except once your film is in, you can only adapt separate shots to daylight by fitting compensating filters. Tungsten gives a bluer sky to the above, dark though it is, and better colour to carlights and other filament sources. The quote applies in part because I was willing to work for an awkward shot rather than just relax and enjoy the outing. At the time my expectations were fairly low, as I was doubtful that the tripod could be kept still enough across the car seat for a sharp image. However I was willing to set it up anyway. Tripod work is slow craft indeed, and so your photo intentions require that extra effort. Twilight has one simple and obvious advantage over night photography: you can see what you are doing. You can focus by eye or auto, and compose quickly. You have a wider range of exposure choices, to allow or prevent movement showing, for example, without the sacrifice in aperture selection that workable shutter times need at night. For a good while as twilight deepens you can also hand-hold the camera on a high ISO. This is convenient if you’re just after a few quick shots because of a time constraint. It’s also straight forward with large apertures on standard prime lenses, or you can use the widest end of your zoom, where camera shake is minimised. Steadier hand-held shots at twilight can be had with the support of car windows and chair backs – plus the use of the self-timer. In the above type of photo, though, depth of focus is supreme and for this you’ll want a calm evening, a tripod and long shutter times. These go with the small aperture required. 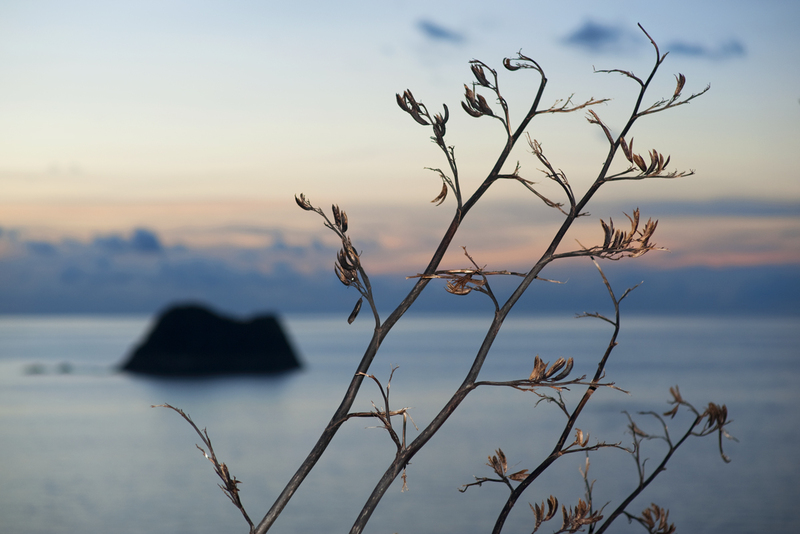 What to look for is colour contrast, because after sunset the ambient light has one supreme quality – it is very flat. It looks even more so when sky is excluded, an effect in itself worth experimenting with. The light from a bright sky following sunset is often a good side-light too, but here the light was more diffused by surrounding trees. What this scan from Fuji slide film shows is how even in flat light, colours have subtly different exposure requirements. The correct exposure for one will sometimes drop another colour out – although preferrably just enough to create an effect. 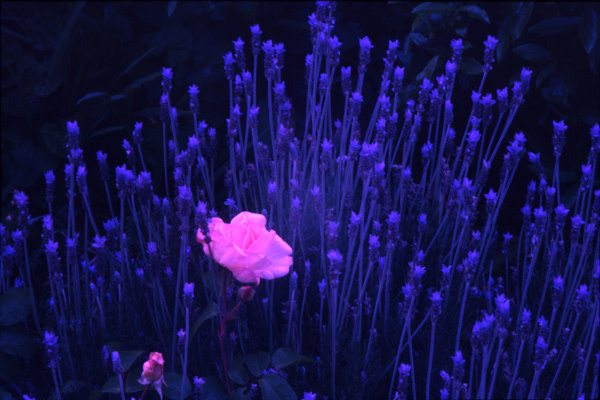 The lavender is thus darker than it appeared, and the background darker still, but this works towards highlighting the rose. So often you expose for an average over the whole frame, but this image shows the benefit of selective exposure where the light provides only low contrast. 50mm, ISO 100. Exposure unrecorded; estimated 1 second at f16. This took around 15 minutes at a small aperture, on Fuji slide film. It was a perfect summer’s evening at Paritutu Centennial Park, and I spent the interlude chatting with a friend. I’m only guessing that the stripe is Venus, but as she often accompanies the early moon it’s a good bet. For trails like this I suggest a crescent moon and a long lens – the longer the better. Crescent moons set soon after sunset, so good colour on your horizon is likely. However to get such a long exposure and the moon suitably bright in the sky, the evening must be darker than it seems here. So moonset cannot be too close to sunset; about an hour between the two seems to work best. We were fortunate to have such a warm and still night, as they are uncommon at this exposed outlook. In winter the same effect can be achieved with the waning moon rising just before dawn, but you’d be looking the other way, and without the balm we enjoyed. For the duration you could of course retire to your car and thermos; it’s really a case of when you prefer to be active and outdoors, but I’m an owl myself, not a lark. The silhouette is of Snapper Rock (Motuotamatea), a semi-tidal island occupied by the old-time Maori. It’s not a brilliant outline but nothing else was available from the vantage point. 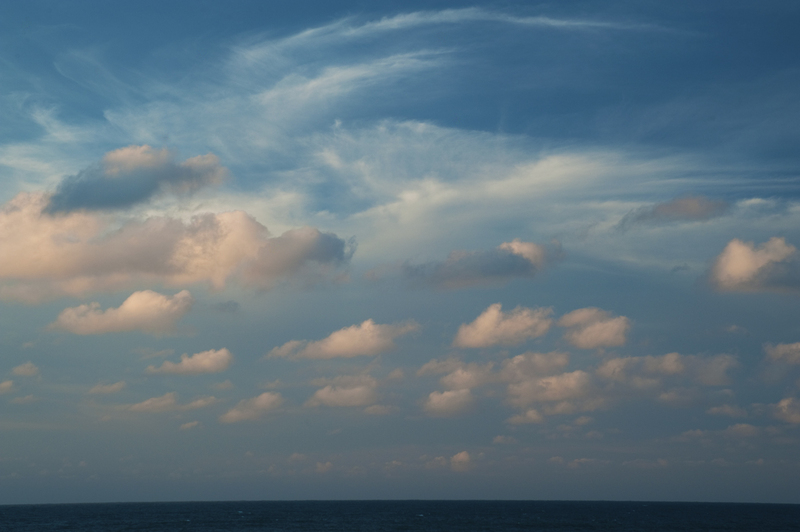 Sometimes for these long-tail compositions a simple horizon will suffice, especially if there is texture below. However for my own I like to add a silhouette to the foreground or near distance, as having a black shape helps give depth and provides extra contrast. Just like the sun, as it nears the horizon the moon colours up, as its rays pass through the atmosphere at an increasingly oblique angle. Here however thin low cloud in the far west has softened the effect. 200mm Pentax Takumar lens, ISO 100. Exposure unrecorded. Here’s a resume of industrial life in north Taranaki. The title is a little deceptive because the power is not going to Paritutu Rock but coming away from it, or rather, right under it, from the power station below our horizon, at Port Taranaki. The station has supposedly been decommissioned but the pylons still hum with transmission. Actually higher than Paritutu is the Stalinist chimney beyond, at 185 m (600 ft). Its location right next to the only natural landmark on this coast for 300 km is a remarkable testimony to New Zealand’s commissar planning of the late 1960s. The converging verticals were hard to avoid from this low viewpoint, necessary because of the brilliant spotlight at the Dow chemical works, which lights up the rock. A short trial shot of 30 seconds at f4 showed how to get to a 15 minute exposure: drop the ISO from 2000 to 400. When you reach the last f-stop on your lens the only remaining adjustment is to light sensitivity, if you want to make extended exposures for the stars. Getting good star trails on a wide angle takes longer than it does on a telephoto. Comparing the lengths of the streaks above with those taken with the 85mm telephoto the same night in no. 39. Mt Taranaki at night from Centennial Drive, I estimate that the blaze above would take just 9 minutes with the longer lens, regardless of the need for a more distant viewpoint. Wide angles still have their uses for the starry sky though. If you are intent on showing the curve of stars around the earth’s rotation points – the poles – then a wide angle is the obvious choice, and the wider the better. On a moonless evening, start with 30 minutes at f16, ISO 200. If your digital battery won’t last that long, use a film camera that does not need a battery for its shutter operation. 28mm, ISO 400. 913 seconds (15.25) minutes at f16. Incandescent light balance. A single second of shutter is a brief joy for the twilight photographer, if only because the results are visible a mere second later. As the evening progresses these exposures become more and more extended as darkness descends. 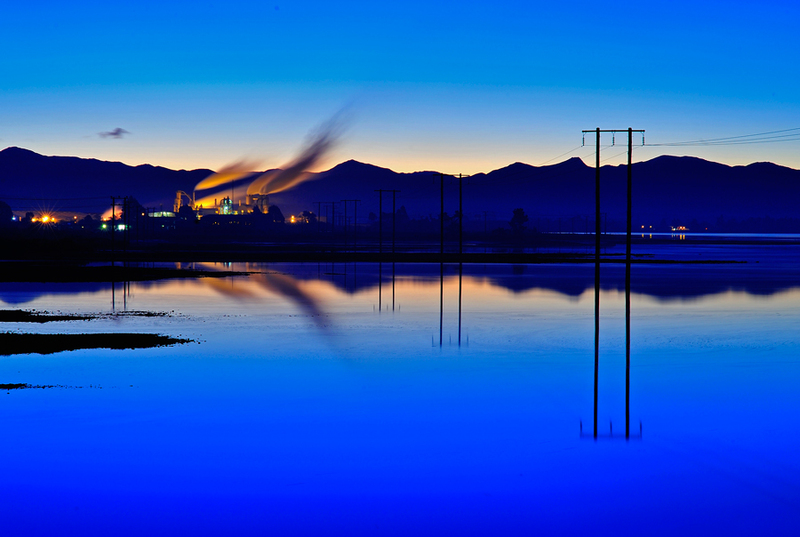 There are good reasons for your night photography to begin at twilight, if not before. A daylight start confers three advantages. Firstly, your gradual adjustment to the longer exposures that the deeper night will require, and secondly, an easier adjustment to the night, as you settle into the routines of picture-taking. Supposedly it takes 20 minutes for our eyes to adapt to the dark although to me that seems overstated. However there is a lag before your irises really relax and allow your night vision to do what it once did for our far-off ancestors outside their caves! The third advantage of a daylight arrival at your location relates to your own sense of security and personal safety in the night. Irrespective of your gender or age, this is of key importance. Physical hazards and nuisances are best established by daylight, as is your sense of direction. The human neighbourhood can also be better assessed then. Human risks can be indirect, e.g. wayward mountain bikers or hunters. Puniho Road ends at the forested edge of Egmont National Park. Although this western side of the mountain is generally less accessible, a track leads up to link with the track around the mountain. At the carpark I waited one winter’s evening for the full moon, wondering if it would ever appear as scheduled. Perhaps with a global positioning device I could have pinpointed its exact rise, but all I knew was that it would come up somewhere around the mountain. I had forgotten what a false horizon even the foothills present. When the moon showed at last next to the rosy summit it was a magic moment. “60mm” (in standard terms), ISO 80. 1 second at f2.8. Lumix LX3. Usually with a sky full of star trails you can safely assume “Film!” I haven’t yet matched anything like this with the Nikon D700, although it’s bound to happen sometime. If you do want to streak the sky with stars it’s easier with a telephoto – here I used a Takumar 200mm on my old Spotmatic. 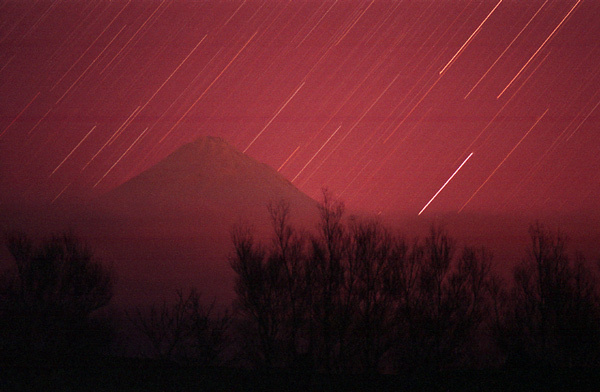 Fuji 100 slide film was exposed for at least an hour at f11 or 16, for maximum star streak. 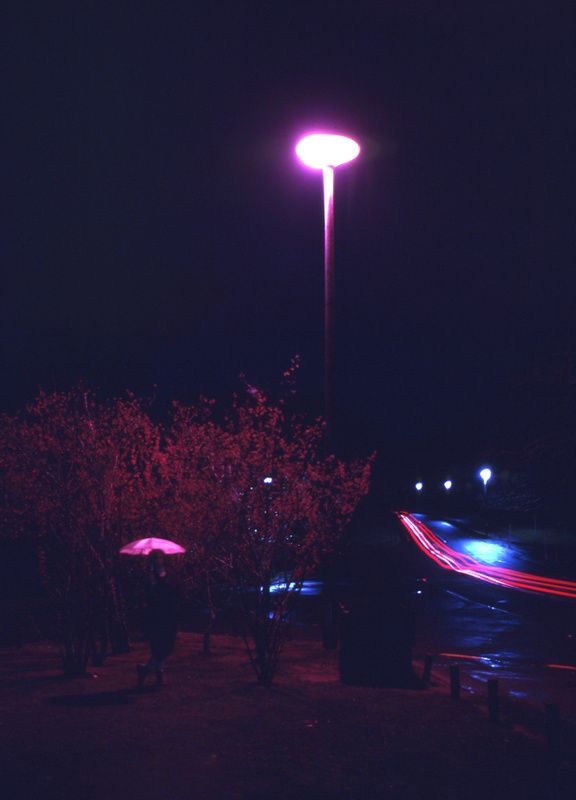 In scanning I have softened the magenta cast, this being the colour shift that comes with long shutter times on film. The blue stars are hard to explain; the range of star colours is probably a surprise to most people too. It does take a dark night to get so many stars on your frame, and it is also hard work composing in the very low light transmitted by an f4 telephoto lens. The location is a closed school at the old mining settlement south of Westhaven Inlet, on the long road to the west coast. The school is now holiday accommodation but the limestone bluffs behind it remain unchanged. The light scatter in the sky can only come from starlight, given the distance from urban life. It was roughly ten days since full moon, so there was no risk of moonlight brightening the sky until 3am. There was no risk of my staying up to see it, either, as we were getting up early next day for the long walk down the Kahurangi coast. In setting up this shot I was confident that nothing would intrude on it, as the lower slopes are forested and the district is barely inhabited. However something unexpected came up – at least in one sense: the long film exposure cramped my digital creativity with the second tripod. I wanted to start experimenting with the bright outside light of the schoolhouse, but had to finish the film exposure first. So it did not get the full exposure that I had planned for it. The adjective refers to my moving shadows, or rather my shadow having moved during the exposure. I counted 30 seconds before I side-stepped away from the tripod in this full minute’s worth of moonlight. The shadow dilution is evident in the darker imprint of the little Lumix on the tripod. I liked the angle of the concrete ford against the willow – the angle also mirrors the hillside. With the moon rising behind me the tripod shadow could not be avoided, so instead I got creative with the problem. Adding shadows also fixed the composition problem of the plane of the ford lacking sufficient interest, although as a monochrome this might still have worked. The warmth of colour shows how the light from a low moon tends towards Golden Syrup – a warmth that daylight can only match when the sun is just above the horizon. I had had to wait some time for the rising moon to clear a spur in the valley, yet when it did there were still the long shadows that are useful to moonlight photography. The “half-lit” adjective also hints at how the image depends for its impact on your angle of view on the laptop screen, or the brightness of your computer monitor. In viewing terms this is a Goldilocks image – not too hot, not too cold please! The scene is the Maitai River, on the outskirts of Nelson, but looking like only a puddle here. April is autumn in New Zealand and all along the Maitai the willows and poplars dress accordingly. The ford gives access to a broad field in the narrow valley. Fords are uncommon in this country and culverts are preferred, as New Zealand rivers flood regularly. I would not perch my gear here after heavy rain. f2 was used at the widest zoom – “24mm”. ISO was a low 100, contributing to a darker effect than I usually seek in my moonlight photography. We had visited this small country graveyard near Rahotu much earlier in the day, and were now on the homeward drive. The unusual twinkling lights were quite eye-catching from the highway, so after parking in the side road I set off across a few hundred metres of paddock in the deepening twilight, intending to get a few photos by the rising moon. My womenfolk refused to get out of the car for this one, but I couldn’t really blame them as we were all pleasantly tired after a good summer’s outing. Either way I would have little time for camerawork. The cemetery had a great sense of peace as night descended. Photographically the light was unusual, being really a mix of moonlight and twilight, as f2.2 and 20 seconds at ISO 80 would suggest to any cognescenti. Lately I have paid more attention to the short interval during which moonlight and the last light of day harmonise. Typically it’s really too dim for us to take in the resulting twin-lit landscape but the camera sensor picks up on this highly unusual effect. It can be seen above on the right side of the frame, where the edges of the graves are lit both ways. 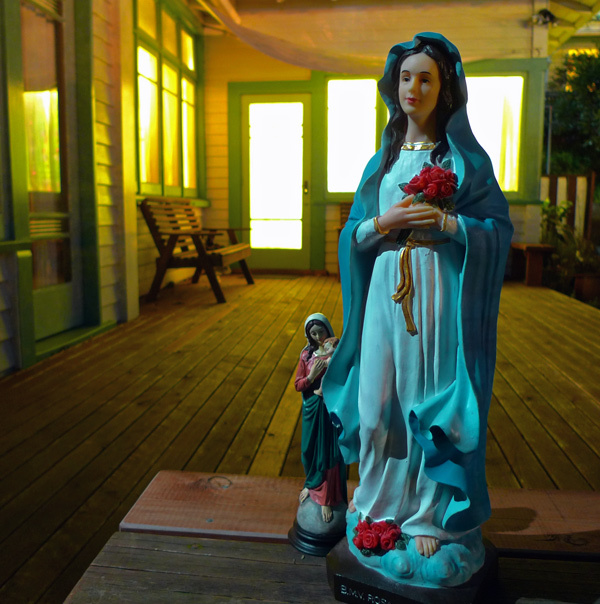 The zoom was not quite at widest – 28mm in full frame terms – on the Lumix LX3. The mountain was almost bare of snow and ice, as it is in late summer. 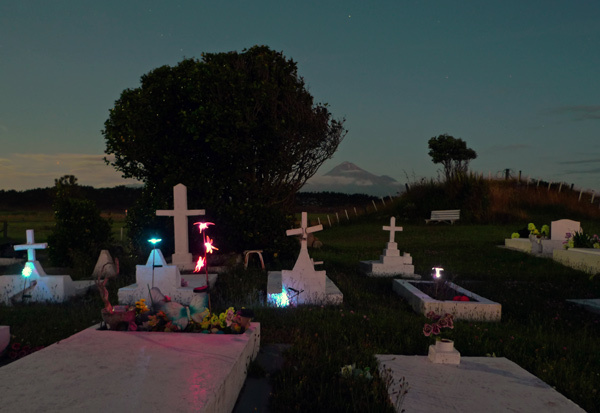 The white graves and the moving lights indicated a Maori graveyard, while the presence of farewell goods on some graves was an unusual sight to us Pakeha. You tend to think of cemeteries as unchanging places but a few months later when I came back at sunset I was surprised at the work in progress, giving improved access and fencing off the tapu ground more adequately. The cemetery occupies two adjoining knolls and I hope one day to channel Ansel Adams from one of them. However I suspect another 30 years of preparation are in order. As well as some perfect timing. This still-life was just outside our house at Marybank, Nelson. Exposure took an hour or more, at around f8 with the Pentax Takumar 50mm, on Kodachrome 64. I recently re-scanned the slide and with greater attention to levels, contrast and colour in Photoshop, I made some gratifying improvements. 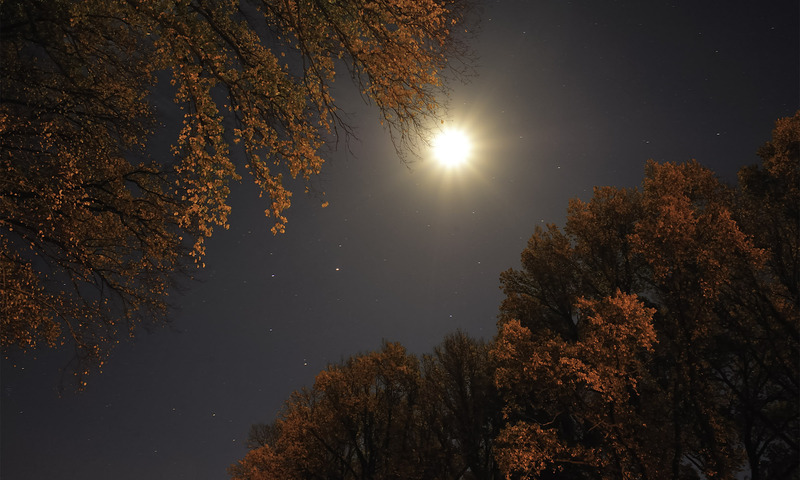 Moonlight photography at home has two initial hurdles – your houselights, and then nearby street lighting. 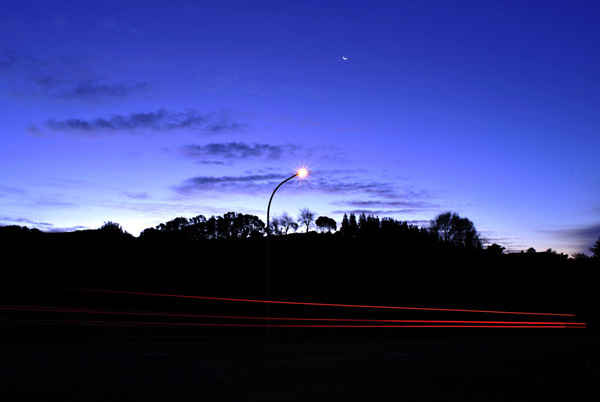 In domestic domains the available moonlight is frequently overwhelmed or discoloured by street lamps. Artificial light does not rule out night camerawork in general, of course, but moon rays do not thrive in competition. In the above case, we turned off the lights in the two adjacent rooms, as even thick curtains will leak wattage over a long exposure. While the camera did its slow work we went to another living room on the other side of the house. Three cheers for obliging housemates! The further challenge of moonlight close-ups is depth of focus, for which by daylight you usually stop down. 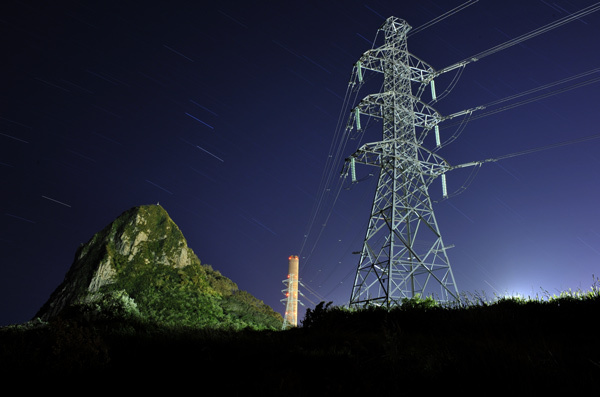 At night, though, this can lead to over-long exposures – without even considering battery power. Fortunately my Pentax Spotmatic did not need power for the shutter (unlike the 6×7, I have belatedly learned), but power drainage is a definite concern with most digital cameras. Then there is the wind. The slightest breeze will make all your efforts for good depth of focus quite pointless. A decent breeze, on the other hand, should give you some scope for motion studies of flowers. Depth of focus is then scarcely relevant, and 60 minutes is unlikely to give you any better flow of colours than 15 mins. However brightly coloured flowers such as poppies are best for this – once you have found some with petals still open. Vertical tripod positions seem much fussier than the horizontal camera. Angles and levels need more attention, as does tripod balance with the extra weight side-long to the head. Be sure to tighten all screws, and especially your head! A photo from our garden in central Nelson, in a corner not reached by any street lighting. 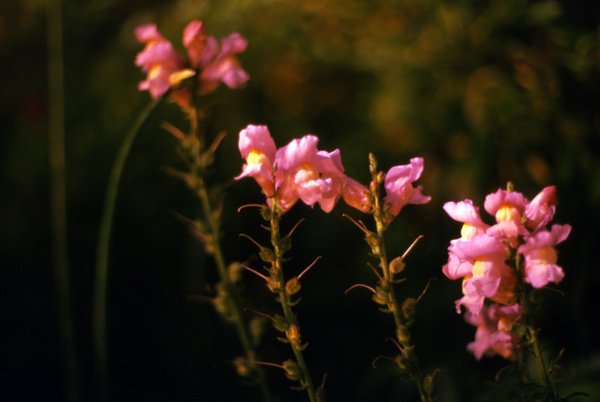 Taken on Fujichrome 100, on the Pentax Spotmatic, these snapdragons have been titivated slightly in Photoshop, as usual with a slide scan. The warm light with which moonlight suffuses its subjects has not been corrected, however. Contrary to what our eyes tell us, moonlight is not blue-ish. In fact the moon gives a positively warm light all night long, something like the light of morning with the sun just up. As with the passage of the sun, however, so moonlight is warmest when the orb is low in the sky, and relatively cooler when the moon is high in the heavens. This close-up demonstrates the shallow focus of a wide open lens (here f1.4), used with a low ISO of 100 for a relatively short time exposure of about 2 minutes, on the B setting. The Spotmatic F was set up on a tripod, and the composition was made fairly readily through the viewfinder, as at f1.4 even by moonlight there is sufficient light transmitted through the lens to frame and compose. Focus however was not so easy, and I had to use a torch for the fine focus required. Focus is always critical this close anyway, and stopping down improves sharpness much less than it does with “big pictures”. While the depth of field is very shallow the bokeh is attractive; the background is a rose bush. The colour contrasts are good and the exposure suitable for the highlights. 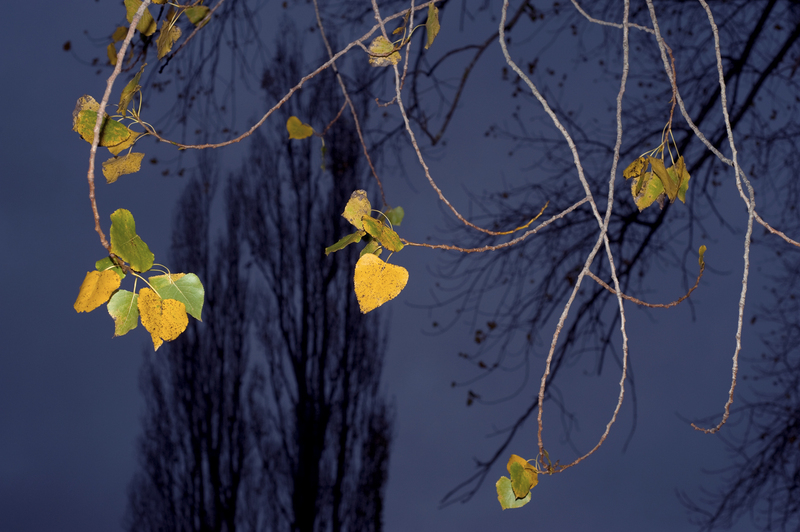 There is no obvious colour shift from reciprocity, although Fuji films are said to be prone to a green shift with long exposure. A still night was a major starting point for this frame to work, but it would also be interesting to try a similar close-up on a windy but clear moonlit night – and with different exposure lengths too. This is something from the far corner of my photo arena, but it’s a follow-on to my previous posts. Entirely experimental, it results from an outing on foot for which I took two cameras but only one tripod. While the Pentax 6×7 was taking long exposures of a cloudy mountain in the gathering twilight, I played around with the Lumix LX3, just to pass the time. Using 10 seconds and f2.8, I hand-held the camera, moving it in slow circles while aiming at the distant headlights. ISO was a low 100 and the zoom was furthest out – only a meagre 60mm in film terms. Much of New Plymouth is laid out in a spoke-and-hub fashion, chiefly along the ridgetops. Here the traffic winds down sinuous Waimea Road, one of the few routes to traverse the city’s hills and dales. The horizon is still visible; the sky is featureless but three colours enliven the frame. It’s intriguing that the light lines are mainly broken into dots, yet are fluid elsewhere. How many cars are here?? Just two, I think, but what of the street lamps? I suspect they had not yet come on. One of the main interests for me in long exposure and night photography is how movement is captured, but always with the camera as a fixed viewpoint. Only with no. 44, Moonrise from the Devonport ferry, is the camera moving – on deck, along with the tripod. Here, however, is the uncommon result of both moving camera and moving subject matter. The lights do not show the blur you associate with camera shake, and I suspect that the steady circular motion explains this. 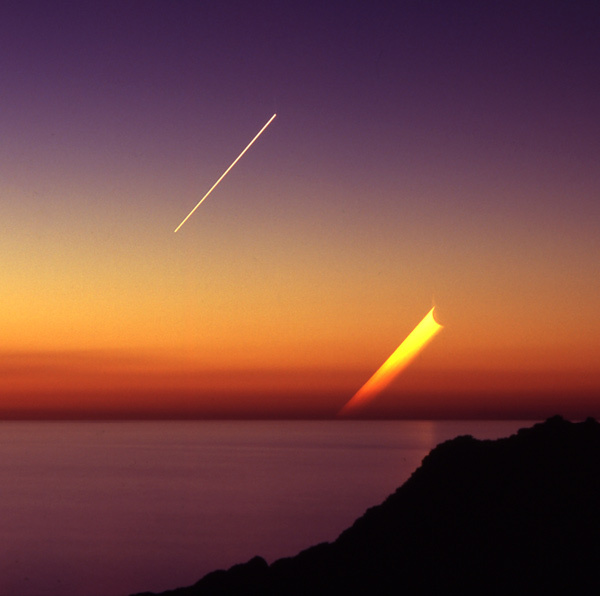 A late twilight so close to the equinox is the result of continuing daylight saving, which in 2007 was extended into early April. As New Zealand standard time is already fixed permanently at 30 minutes ahead of its natural position, for 27 weeks of the year we are 90 minutes ahead of ourselves. This image is the Technicolor companion to no. 42. 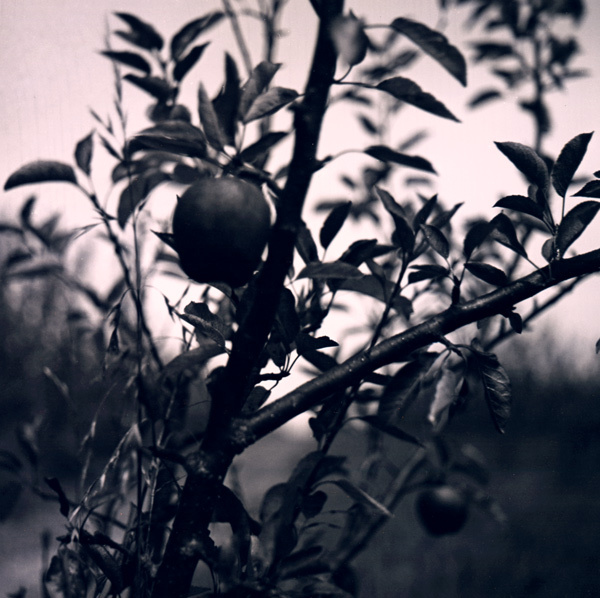 Neudorf apples by moonlight, shown in my previous series of square format moonlight photography. Taken the same night in the same Nelson orchard, the colours are quite reminiscent of the 1950s, as the colour shift on Kodachrome 25 has not been corrected. The shift does not relate to ageing of the transparency, although that might happen yet. 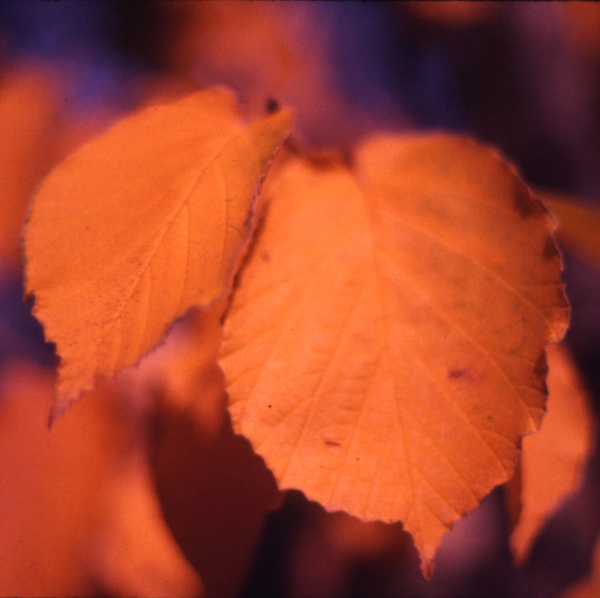 Instead the orange and magenta cast is due to reciprocity failure, the result of an 8 minute (approx) exposure, which the film was not designed for. Kodak films show a marked magenta bias with the long shutters needed for moonlight. Full correction in Photoshop has proved possible, but I prefer the greater impact of the original. The square framing has, however, enhanced it. 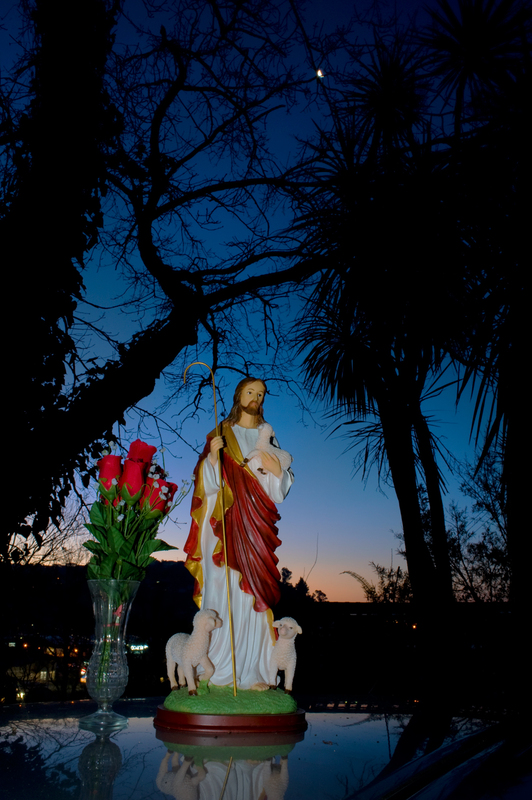 Using ISO 25 by moonlight is the slow work of saints (present company excepted). Shot after shot, a patience is required that’s now even harder to find in the 21st century. The fine grain results require l-o-n-g exposures with only shallow depths of field, using wide-open apertures. Here with the Pentax Takumar standard lens set on f1.4 some sharpness has been achieved, fortunately on a very still night. The background blur is called bokeh, and variations in it from different apertures and lenses are now assessed as you would judge a good wine. For better focus I could perhaps have used f8 – and gone back inside for 4 hours, as the tree was handy to Jane’s cottage – but over several hours there’s a much higher risk of the lens fogging, a breeze getting up or an orchard vehicle coming by. As much as I appreciated the fact that care and patience would deliver some possibly stunning results, other creative opportunities by the full moon would not be stifled. What also held me back was my belief that there are few places where you can safely leave your gear “at work” for 4 hours unattended. Here’s the female form in another light entirely – although still moonlight photography. Once again there’s a mix of moonlight and incandescent light, but in reverse to no. 76, Moonrise at Long Bay. The foreground above is moonlight, the background household tungsten. The moonlight only balances (more or less) with the stronger artificial light because it has filtered through blinds on the windows and door. However, at the time the houselights seemed a bare glimmer. As a companion to no. 27, St Mary’s evening vigil, this is a more congenial domestic environment. 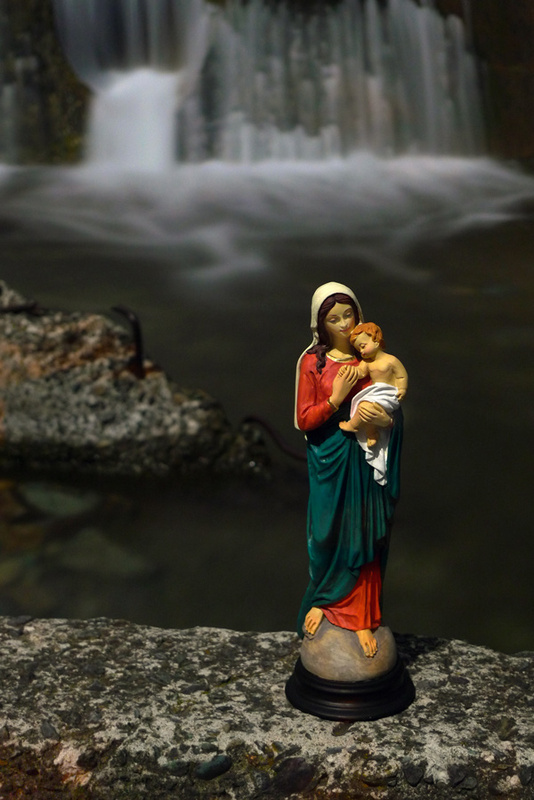 The figurines come from Bangkok, from a Catholic supplies shop not listed in the tourist literature. In a Thai household shrine these statuettes would be tended with garlands and other offerings, but their post here was a private visit, and only transitory. The house was supplied by Derek and Claire (with thanks). Only at 11pm had the moon moved far enough around the two storeys to light this scene. Being a winter moon it was high in the sky, yet the Holy Mothers lack the summery look that the solar equivalent would give in January. Exposure was f2 for 60 seconds, at ISO 200, on the Lumix LX3, with the zoom at its widest. For me the appeal here is in the offbeat contrast between the fluid lines of the blue and red figures and the more angular forms of yellow, green and brown. The angles give a strong sense of perspective, although a limited focus is noted on the close-up at f2, even with a very wide angle. Tungsten light balance was not used. The square format suits this frame very well, and improves the original 3:2 composition. But starting out with square format is not easy, as I found with my old 6×6 cameras. Effective framing took a lot more effort than did the standard rectangle of the Pentax. The 6×7 compromise adopted by Asahi Pentax for their medium-format SLR was a considerable success. Well located between massive Ruapehu and Tongariro, Ngauruhoe is a young volcano (2291 m, or 7516 ft); the three mountains make up New Zealand’s oldest national park. The cone rivals Mt Taranaki in symmetry but lacks her majesty of situation. However in its recent history Ngauruhoe is certainly the more active volcano. 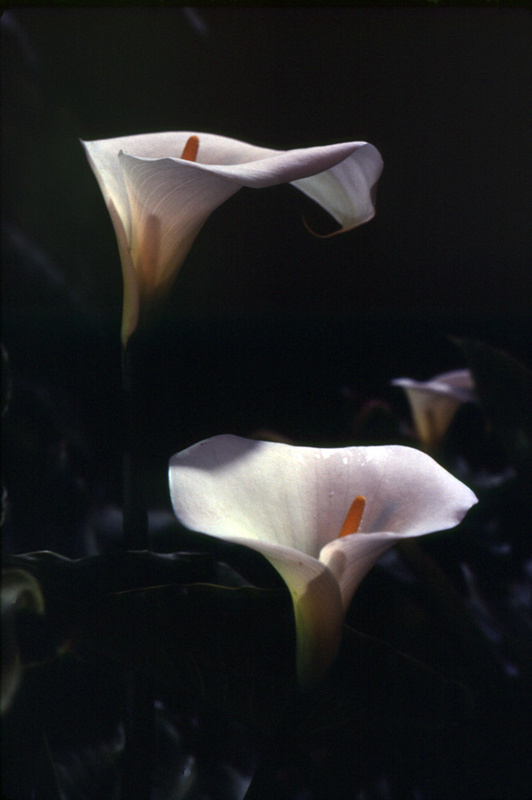 For this simple composition I used Kodachrome 64 in a Pentax Spotmatic F, with a Tamron 135mm lens. 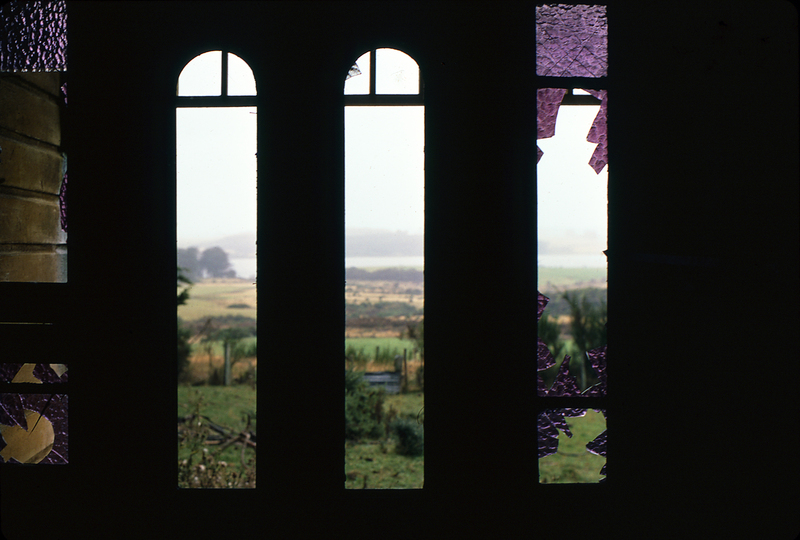 I prefer slide film in the 25 – 100 ISO range; slides have the advantage over colour negative of more intense and unmediated colour, a critical factor in many photos. Exposure details were unrecorded, but most likely this shot is a hand-held 1/125th at f2.8, using the self-timer to reduce camera shake. Ideally, by using a tripod I could have stopped down for perfect focus throughout. However I believe the background softness is much more acceptable to the human eye than the reverse – unfocussed foreground interest. This type of scene can only be taken with a telephoto. A flattened perspective is highly suitable when you want only a few elements in a picture. A good mountain photo at sunset is usually no great challenge, but by adding something extra I think more impact is achieved. The Brewster Theory of Composition holds that the two simple layers or planes needed to make a good picture are substantially improved by a third item of interest, usually a smaller detail in the scene. Three keen elements = one good picture, yet it is surprising how hard this understanding is to apply in the field, when the pictures are actually taken. The essential ingredient of course is having the twilight closely match the street light. This balance lasts only a few minutes each evening. By exposing for the highlights landscape details are necessarily lost, but the cloud patch comes through as a good “third hit”. I have not been back to this spot for years but probably the Skotel now occupies the site. A single star, a dash of moonlight and the ever-present sodium lighting contribute to this striking composition. My shadow only hints at the heavy coat I wore against a chilly wind, whose blast is visible in the ruffling of the cabbage tree leaves. The high, solid fence stumps the dead end of Drake St at Waikawa Beach, near Levin. The landowners evidently wanted no truck with locals or the weekend throng – an impression they have reinforced further on with a very effective electric fence. Adding my own shadow broke up the blankness of the wall and echoes the dark form of the cabbage tree quite well. It’s a pity there isn’t more interest in the sky, but it was swept clear of any cloud by the fierce southerly. The Lumix LX3 fortunately does not offer much wind resistance, being so compact, so I could stand well away from the tripod. It’s a rare night when conditions are truly perfect for moonlight photography, especially if deck chairs, bougainvillea and emerald waters are considered essential ingredients. The pale sky comes from a high, full moon but the hue owes much to tungsten, a setting selected to counteract the orange cast of the street lighting. This light has mixed nicely with the moonlight on the cabbage tree. Zoom was at the longest, 60mm (in 35mm camera terms), and exposure was f2.8 for only 20 seconds, on a low ISO 200. The background topography sums up this sandy coast, where older, grassed dunes predate a wide frontage of more active material on the beach. As with so much of the pastoral coastline of New Zealand, the landscape is somewhat bleak and away from the baches and subdivisions it is only sparsely settled. Apart from Dr Seuss cabbage trees, the typical trees of this coast are those just visible on the margins – gloomy pines, by the hectare. The first question asked whenever I show this slide is “How come the car headlights haven’t picked you out on the side of the road”. 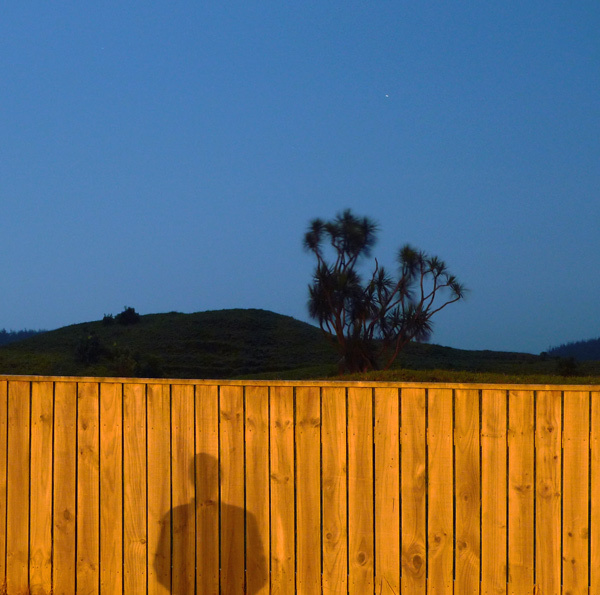 After all, that’s my own silhouette, for which I stood motionless over many minutes, while gazing up the moonlit south Otago coast. 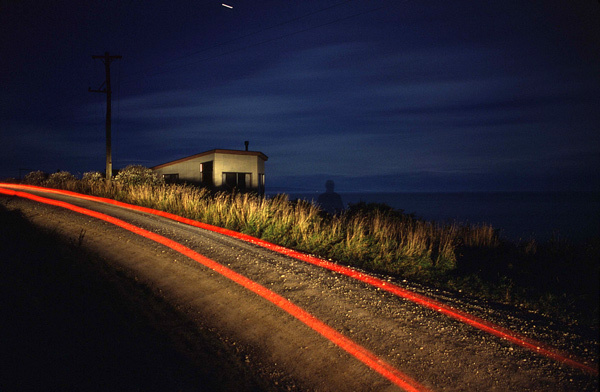 An unoccupied crib (beach house), a single star trail and power pole complete the picture – plus some streaking cloud. The simple answer is that as the car approached I had just enough time to compose with the wide angle, frantically tilting the camera down to take in the right amount of then-empty road. I was after a sweep of headlights and a rear light trail, and guessed that another car wouldn’t be along for that anytime soon – it was a week night, and off-season in a beach settlement far from any city. Once the car had gone past I leisurely crossed the road, took up the position to best effect and began my sentry duty. Counted by seconds then, the ingredients were something like: car = 5 seconds, moon = 500 seconds. The 28mm lens on the Pentax was set at maximum, f2.5, with time elapsed about 8 to 9 minutes. And no other car came near. Kodachrome 25 was the film. Although a very good one its speed now seems of horse and buggy vintage. It also had a colour chemistry that only a Kodak lab could unlock, in this country anyway. Surprisingly though, for the night photographer a slow film or low ISO setting still gives plenty of creative scope, as well as good latitude and fine resolution – as long as you stick to wide angle lenses. They offer better depth of field and easier focus. With a low ISO setting, when your compositions require serious depth of field, as 35mm/full frame non-wide lenses often do, then the small and smaller f-stops involved mean long and longer exposure times to compensate. And more and more patience – so often a scarce commodity! 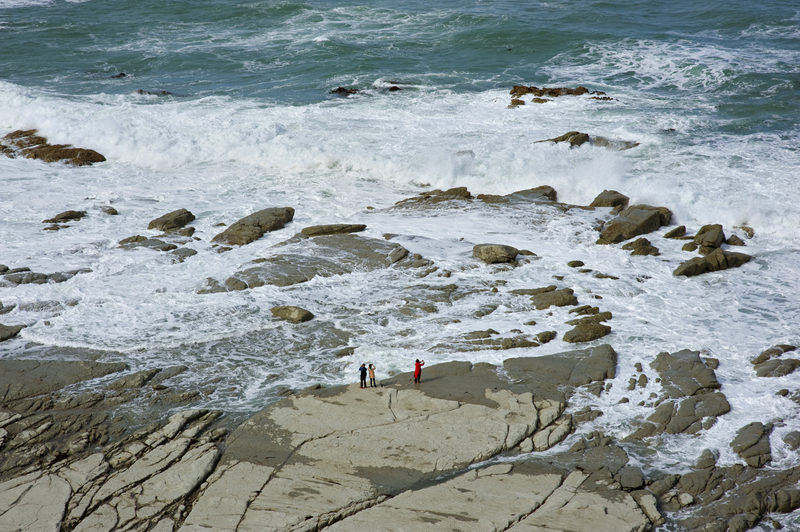 Bullock Creek is not far from the pancake rocks at Punakaiki, on the South Island’s West Coast. 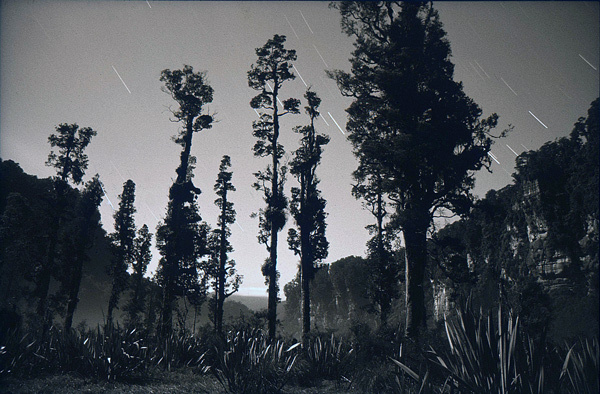 This 40-minute exposure by moonlight was taken by the side of the gravel road running up the pastoral floor of the canyon to the backcountry of Paparoa National Park. 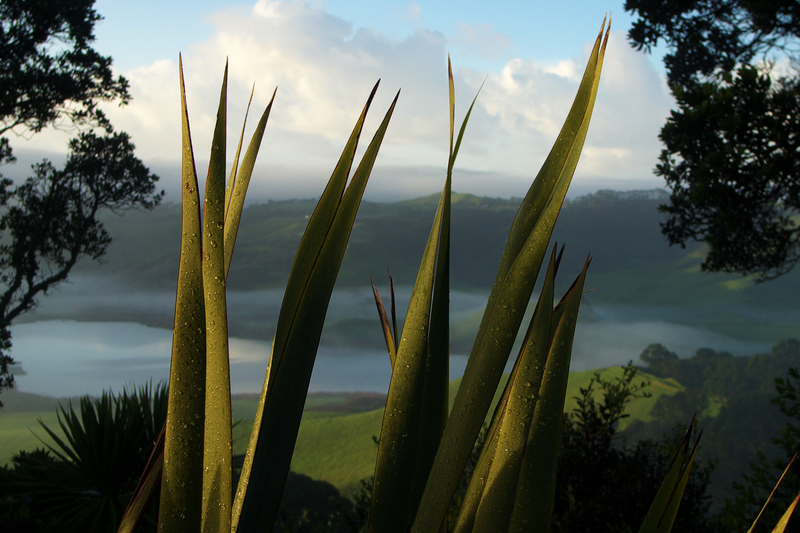 Mist slowly forms in the middle distance; the limestone cliffs have numerous caves at river level; the trees are all kahikatea, a white pine which doesn’t mind soggy ground – and nor does the flax. The star trails show their curve around the south pole, so we are looking east or southeast here. 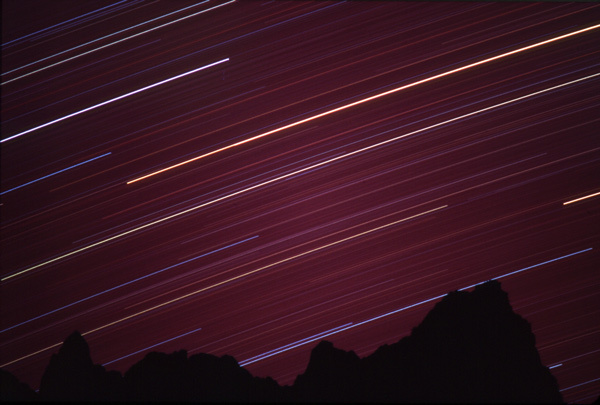 The view is wide angle (28mm) and at least a half-hour of open aperture is evident in the length of the star trails, as these take longer with a wide angle. Exposures of this length don’t occur to me very often, as usually I’m weighing up the chance of getting 5 other shots for the same time spent. Also there are other constraints, even when battery life was irrelevant back in the time of film. Why risk your lens misting up on an autumn evening with a shot lasting an hour? And because with such long exposures you tend to walk away from your gear – to sit in the car, on the porch or best of all, around the campfire – the risk of disturbance is so much the greater from stock, wild animals, walkers and dogs, hunters’ vehicles. We were camped fairly close by, so for this one I returned to comfort and company to wait out the time. No one drove by the entire night. The monochrome here is Kodak’s fine grain Panatomic-X, 32 ISO. Although this was not a film I used much, the results when reversal-processed with a special kit were impressive. I then sepia-toned the slide for extra contrast. After scanning, however, I decided the more neutral cast given it by “Auto colour correction” was just as appealing, and that’s how you see it. Neudorf is an orcharding district near Upper Moutere, Nelson; I took this not far from where my girlfriend and I were staying in a worker’s cottage, occupied by her apple-picking sister. Not a simple composition, this experiment in moonlight photography will not appeal to everyone, but it has held my own attention with its selective focus, deep tones and unusual tints. I’m not pleased with the background, but these are so often hard to assess in nocturnal camerawork. Without a powerful torch most focussing by moonlight at close range can only be approximate with a roll film camera (such as the Yashicamat 124G), which is no surprise with a bigger format. Additionally the film was Ilford Pan F, a slow 50 ISO, although here it was marginally uprated to 80 ISO. Once reciprocity slow-down is factored in, exposures at f3.5 (max aperture of standard lens) are in the vicinity of 10 – 20 minutes, and recalling my impatience to take other photos around the orchard, the exposure above would have been at the shorter end. I had 2 cameras but only one tripod. The depth of tone here reflects the fine grain of a slow-speed film, while the odd effect of two tints is achieved readily in Photoshop. After scanning I converted Mode to colour, and then under Colour variations I played around with different combinations, with Shadows and Highlights. 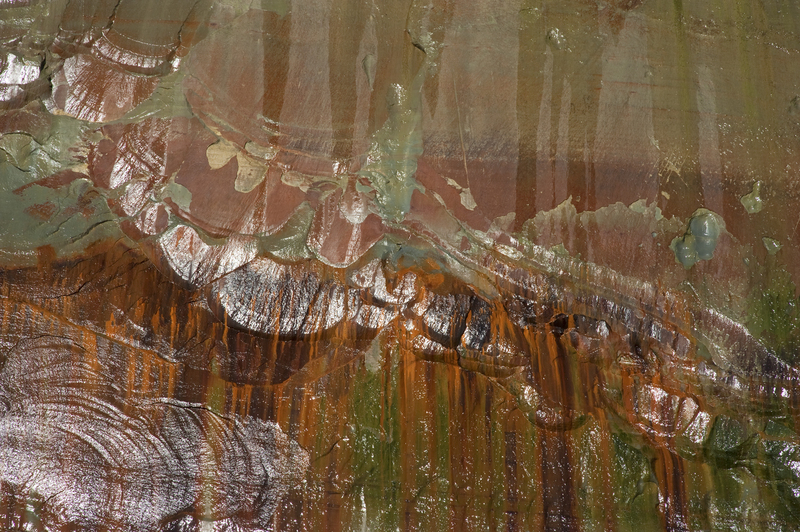 There are only three colours available (red, blue or green), or their mixture in layers. If you live around about our southern latitudes then May is a good month to go moonlighting: the nights are often clear and the moon is higher in the sky than in summer (in reverse of the seasonal solar arc). Best of all, however, is the early start you can make in the evening, especially on the night before full, when the moon is already up. When you have creative juices rising too, though, one tripod and slow film does hamper you. We were touring the South Island on a calendar assignment, and had arrived for Easter at Graham’s bucolic pad at Woodstock, south of Hokitika. He and Sue were paying $10 a week for this… everything in sight here had seen better days, including my white Morris van peeping around the corner. However the derelict Wolseley was a spare. The house was just back from the highway; oddly neither house nor highway are there now, the main road south being moved coastways sometime in the 1990s. This looks wide angle; actual exposure was unrecorded but likely to be f8 for an hour. 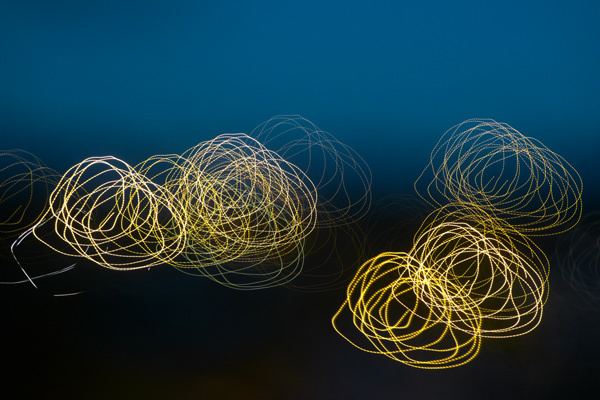 Assuming your gear is safe from hazard or interference, long exposures from a garden can be quite comfortable ones for the photographer, as you head back indoors for the duration – while keeping one eye on the clock. A faint star trail is visible above the roofline although moonlit skies are really too bright to do the stars justice. The breeze has blurred the washing on the line, as well as the trees at the back. The house lights are not direct; even after soaking through the curtains their wattage is stronger than the wan sunlight reflected by the moon (just 1 or 2 watts). The water tank supplied the household; the late tomatoes supplied the salad. Further interest could be added had I got someone to stand for just a few minutes on the path to the right of the tomatoes. A spectral figure would then deliver a compositional third punch. The film was Kodak’s slowest panchromatic B&W, Panatomic X, rated at 32 ISO as I recall. 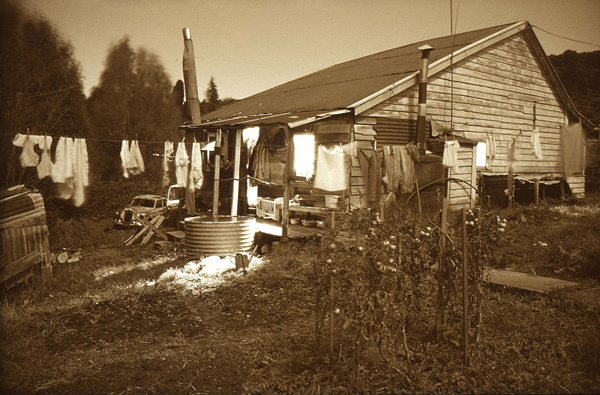 It was developed by a reversal process and then sepia toned, to add contrast. This procedure was a fraught one as frames were toned singly and I lost a good number to careless handling. However this one survived, to be screened many times as a personal favourite; fortunately I understand the sepia chemicals make it resistant to light-fade. Suggesting an alien spacecraft landing, this scene is one only a vertical composition could accommodate. Unspooked, Jane was also accommodating and held her umbrella pose well for almost a minute, as cars drifted past on Domain Drive, somewhere near the Auckland Museum. We had wandered through the Domain at dusk; it was too cloudy for any moon but the drizzle gave us a wet road and reflections. The pink umbrella sets off the wintry leaves (still there owing to the streetlight?) and the light trails. I was using Kodak 2483, an E-4 microscope film which I had some fun with over 1981-82, after buying some outdated rolls for 50 cents each. Its strong contrast preshadowed the advent of vivid slide films sometime after Y2K. 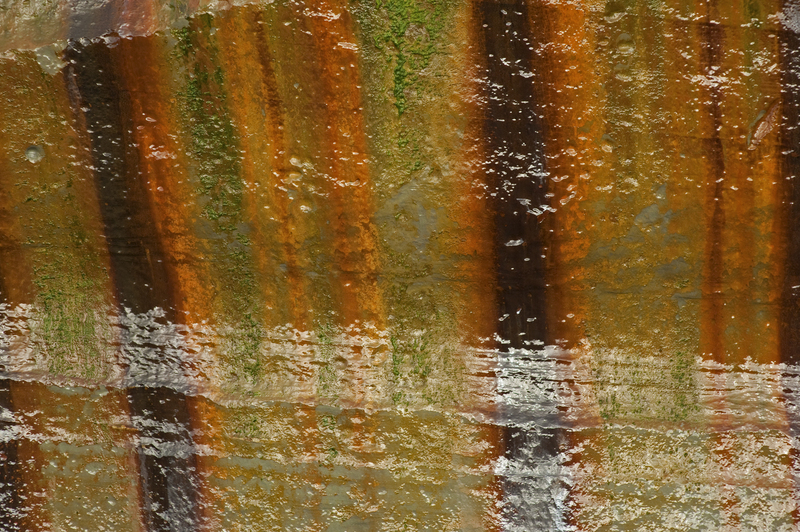 2483 was also distinctive for its fine grain, although this was achieved with a laughably low ISO of 16. What took more getting used to was the strong magenta bias – a shocker at first, although I soon learned how to apply it. Here the cast is emphasised with a further colour shift likely from the long exposure, known as a reciprocity effect. Given the high contrast, the exposure is about as good as you’d get on the one frame of film. With film of course there is not the instant feedback on exposure guestimates, meaning I regularly lost frames in bracketing or from careless estimates. 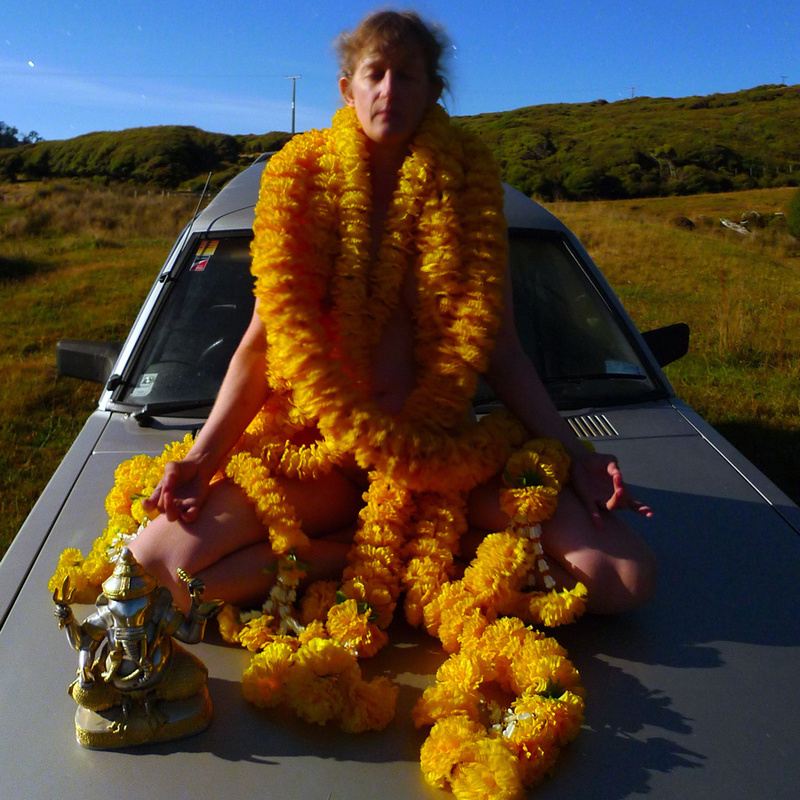 At least I didn’t lose friends as well – their patience for my photo experimenting was remarkable.